PCL to Flash Catalog , provide easy way to convert PCL flies into page-flipping catalog. 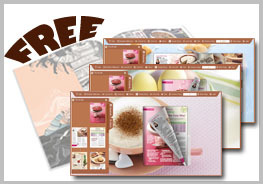 Many powerful function, free templates build-in flash catalog software enable users create elegant catalog in 3 steps. Web Flash Catcher allows you save (catch) all Flash animations from internet, including Flash websites, Flash game, Flash MTV, Flash Movie, Flash advertisement, or what ever Flash files you see on the web. What you need to do is just a simple click! PDF to Flash Flip Book Converter is an easy to use tool which can help you quickly create flash flip books from PDF files. The leader in Flash content creation is now free to use when publishing to a FREE ViewletCentral discovery account. ViewletBuilder makes it possible for anyone to create compelling, animated Flash tutorials, onlinecourses and demos with ease. This amazing, elegant extension can be used to create a banner, news scroller, gallery, one-level menu or just a beautiful flash element for your webpage. Flash Flipping Shopping Catalog with easy to use interface, is the best way to flip shopping cart to digital flash book in a few clicks of mouse. It offers a new and interesting way to create products and promote, sell them online. Flash Banner Builder is a powerful PowerPoint plug-in.Create professional-looking flash banner easily and effectively with PowerPoint knowledge in just few clicks. No flash programming skills are required. Supports PowerPoint 2010 now. A professional but easy to use bundle to create your own amazing flash animation and convert it to video format for fast and wide sharing on webpage. Flash2X Flash Player is a free flash player which playbacks both flash (SWF) and flash videos (FLV). You can play your favourite flash and flash videos, create playlists and enjoy them with this powerful free flash player. FlashMapOne provides a most effective interactive map solutions for your project. Use FlashMapOne, you can create animated, interactive and data-driven Flash Maps for your dynamic web applications. FLV Encoder SDK is a DLL to create Flash Video Files. You can use it in programs written in C++, Delphi, C# and more. Create FLV in your programs with FLV Encoder SDK. Simple API. Samples are included. Sothink SWF Quicker is the leading Flash Editor &amp; Flash Maker. With this Flash software, you can export flash animation and HTML5. The Flash Editor provides the same vector editing capability as Adobe Flash but cost less. Convert video files to flash video format (FLV), apply unique flash player styles, create a sample html page with the embedded video, specify output video parameters with AVS Video to Flash! PPT to Flash Catalog Pro is a all-in-one solution page turning catalog software which can make powerpoint flip and create page-flipping pwoerpoint catalog with various media factors such as video, flash, audio, sound etc.